The labor picture is not improving in the U.S. and prospects for any type of a much needed short-intermediate term recovery grow more and more dubious with each passing jobs report. To this end, Jeff Cox of CNBC noted in a September 2, 2011 article entitled, “Economy Gains No Jobs in August, Rate Holds at 9.1%” that, “The U.S. economy created no jobs and the unemployment rate held steadily higher at 9.1 percent in August, fueling concerns that the U.S. is heading for another recession. It was the first time since World War II that the economy had precisely net zero jobs created for a month.” Moody’s Analytics additionally noted on Friday, September 2, 2011, that the private sectors created a “paltry 17,000 jobs” which were offset by Government implemented job cuts. These results were registered in stark contrast to the Wall Street’s consensus expectation for a net 80,000 jobs increase. Unfortunately, even if the U.S. economy hit the latter target, it would still keep the U.S. economy way behind the purported 200,000 new job creations needed to make meaningful progress in reducing the unemployment rate, according to Moody’s Analytics. 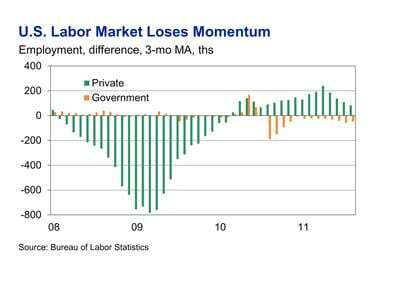 Further, earlier jobs data reports were actually revised lower by 58,000 jobs for the previous two months. While most policy makers, and analysts, seem to agree that the U.S. economy is now essentially stalling, not necessarily declining into another new recessionary cycle, it is noteworthy that Moody’s Analytics also recently increased its possibility of the U.S. entering a recession within six months to 40% on Friday – up from its previous 33% forecast in July. There is no question, as we see it at Hennion & Walsh, that a crisis in confidence is brewing across the country, which is not being helped by the nation’s policy makers – on Capitol Hill or in the White House. The issue of jobs will remain a critical issue in all political debates leading into the 2012 presidential election. A similar lack of confidence and downright anger is starting to be expressed in many other developed countries as well.